Estrogenic chemicals have traditionally been investigated for their role in disrupting male reproductive development in fish. However it is now known that estrogens play a role in a wide variety of physiological processes. This in turn, makes it highly likely that estrogenic chemicals may have a much wider spectrum of effects. My work focuses on the effects of estrogenic chemicals on fish health. I am utilising a novel and exciting Estrogen Response Element transgenic (ERE-TG) zebrafish model developed by staff within the EARBG group. These ERE-TG fish are capable of detecting estrogenic EDCs at environmentally relevant exposure concentrations, indicating responsive tissues with the production of green fluorescent protein (GFP). Exposure of ERE-TG fish to different estrogenic chemicals shows specific patterns of GFP expression in a variety of tissues including the liver, heart, skeletal muscle, ear, forebrain, neuromast and ganglions, identifying tissues not previously associated with estrogen signalling and disruption. Early research screening different chemicals highlighted bisphenol A (BPA) as a particular chemical of interest. 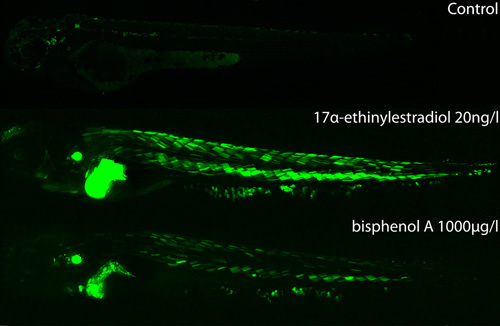 Using these ERE-TG fish we have shown that BPA induces specific patterns of GFP expression which shows common targets with the model steroidal synthetic estrogen, 17α-ethinylestradiol, but with an apparent stronger signal in the heart. This data may be of particular interest as BPA has been linked with heart defects in animal exposures and heart disease in human populations. I am now attempting to unravel the mechanisms of BPA activation of GFP in our ERE-TG fish.